Some people like to remotely start their cars when it’s cold outside. Dan Beadle took this idea one step further by Internet-enabling his mountainside retreat’s hydronics system. The innovative design enables him to warm the house well in advance of his arrival. Serving up the current temperature involves several computers, a Wi-Fi access point, and a DPAC Airborne module. My mountain home, where I have vacationed for years, is well insulated, making it a snap for the heater system to keep warm. I have a small, efficient heater; however, it takes forever to warm the house from a 50°F standby to a livable 68°F. Typically, I arrive late and shiver in my jacket for three or four hours until the house warms up—and that does not warm the entire house, just the portion needed to get through the night. I had been thinking for a while about Internet-enabling the system. The idea was to turn on the heater before we start up the mountain. I have DSL at the house with a fixed IP. So, it seemed like it would be a simple task to enable a thermostat. I considered using an X10 thermostat, but, after a few of our X10-enabled lights found a mind of their own, I decided that I wanted better reliability. My next thought was to use simple copper to do the hook-up. I started planning a cable from my office/DSL entry up to the logical thermostat location. Then I procrastinated. I could not bring myself to run the wires along the surface of my redwood paneling. (And it was not at all feasible to remove the paneling.) Wireless makes the problem a lot simpler: there are no wires to run, and the applications processor and digital I/O on the module make the hardware design trivial. 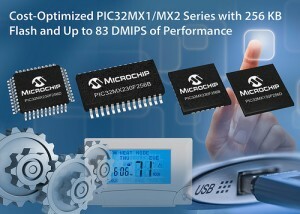 Microchip Technology recently announced a new series within its PIC32MX1/2 32-bit microcontroller family that features a 256-KB flash configureation and 16-KB of RAM. The microcontrollers provide flexibility to low-cost applications that need complex algorithms and application code. More specifically, they are intended to help designers looking to develop products with capacitive touch screens or touch buttons, as well as USB device/host/OTG connectivity. 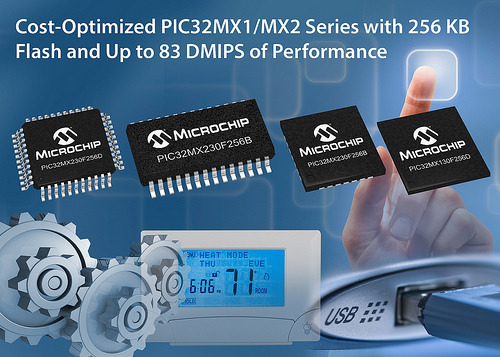 The PIC32MX1/2 MCU series provides up to 50 MHz/83 DMIPS performance for executing advanced control applications and mTouch capacitive touch sensing. In addition, it has an enhanced 8-bit Parallel Master Port (PMP) for graphics or external memory, a 10-bit, 1-Msps, 13-channel ADC, support for SPI and I2S serial communications interfaces, and USB device/host/On-the-Go (OTG) functionality. Microchip’s MPLAB Harmony software development framework further simplifies designs by integrating the license, resale, and support of Microchip and third-party middleware, drivers, libraries and Real-Time Operating Systems (RTOS). Specifically, Microchip’s readily available software packages—including USB stacks and Graphics and Touch libraries—can greatly reduce the development time of applications such as consumer, industrial and general-purpose embedded control. These latest PIC32MX1/2 MCUs are available now in 28-pin QFN, SPDIP ,and SSOP packages and 44-pin QFN, TQFP and VTLA packages. Pricing starts at $1.91 each, in 10,000-unit quantities. Infineon Technologies recently extended its StrongIRFET Power MOSFET family. The Logic Level StrongIRFETs can be driven directly from a microcontroller, thus saving space and cutting costs. Additionally, the MOSFETs are highly rugged and thus help lengthen the service life of the electronic devices, such as DIY power tools (e.g., cordless drills) that have to be handy and durable. The StrongIRFET family enables high energy efficiency in electric appliances. 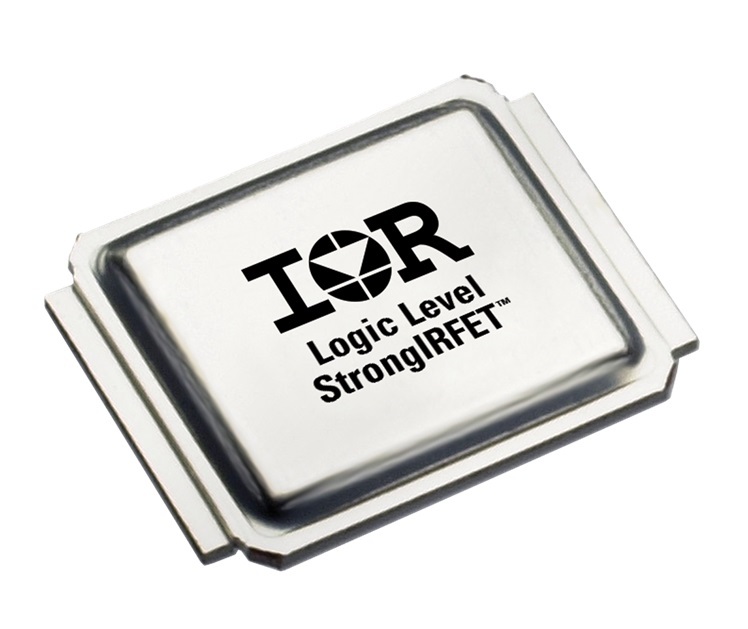 With the logic level extension, Infineon meets the market’s demand for StrongIRFETs that do not require a stand-alone driver. In the logic level variant the necessary gate-source voltage is reduced to 4.5 V. Thus, you can directly connect the MOSFET with the microcontroller in many applications. The characteristic performance features include: low on-state resistance (0.52 mΩ typical and 0.97 mΩ maximum) for reduced conduction losses, high current carrying capability for increased power capability, and rugged silicon all make for high system reliability. 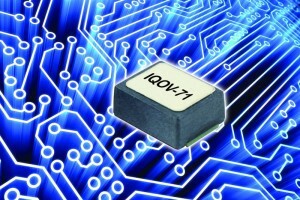 IQD’s latest Oven-Controlled Crystal Oscillator (OCXO), the IQOV-71 series, is housed in four-pad plastic package with a fiber glass base. Despite it 9.7 × 7.5 mm size, it offers very low frequency stabilities down to ±10 ppb over an operating temperature range of –20° to 70°C or ±20 ppb over –40° to 85°C. The available standard frequencies include 10 MHz, 12.8 MHz, 19.2 MHz, 20 MHz, 24.576 MHz, 25 MHz, 30.72 MHz, 38.88 MHz, 40 MHz, 49.152 MHz, and 50 MHz, which will satisfy most applications. Other frequencies in the range of 5 to 50 MHz can be developed for commercially viable quantities. Power consumption is typically less than 1 W during the warm up phase, which only takes approximately 3 minutes, and less than 0.4 W once the device has reached steady state. Frequency aging is less than 2 ppb per day and a maximum of 3 ppm over a 10-year period. 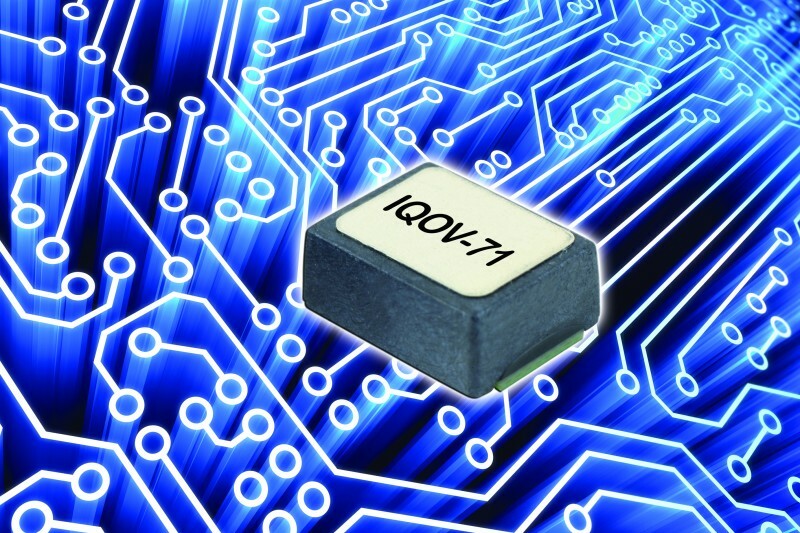 The IQOV-71 offers either a standard HCMOS or Clipped sinewave output, with operating voltages specified at either 3.3 or 5 V. Low phase noise performance is assured with figures of –152 dBC/Hz at 10 kHz offset and only –153 dBc/Hz at 100 kHz from the carrier. The G-sensitivity is <2 ppb/G making the design suitable for applications such as military radios and airborn applications. In order to maximize flexibility there is an option to specify external frequency adjustment by the application of a variable control voltage that allows for crystal ageing as well as changes in the circuit conditions. This variation is also extremely linear being less than 1% as against a more typical 5%. This part is intended for a wide range of applications including picocells for the ever-increasing rage of wireless applications, satellite communication, broadcasting, microwave, and instrumentation, such as frequency counters and analyzers. 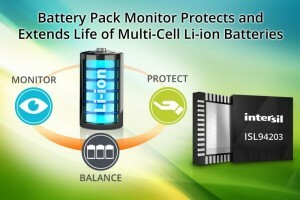 Intersil Corp. recently announced the ISL94203 3-to-8 cell battery pack monitor that supports lithium-ion (Li-ion) and other batteries. The ISL94203 can monitor, protect, and cell balance rechargeable battery packs to maximize battery life and ensure safe charging and system operation. It works as a stand-alone battery management system for rechargeable Li-ion battery packs. The ISL94203’s internal state machine has five preprogrammed stages that accurately control each cell of a battery pack to extend operating life. 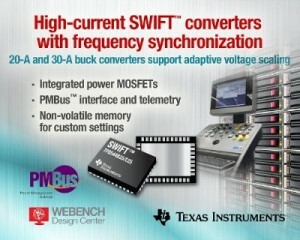 In addition, it integrates high-side charge/discharge FET drive circuitry. The ISL94203 battery pack monitor is available now through Intersil’s worldwide network of authorized distributors. The ISL94203 comes in a 6 mm × 6 mm, 48-lead TQFN package, and is priced at $2.19 in 1,000-piece quantities. The ISL94203EVKIT1Z evaluation kit ($328) includes an evaluation board, interface board with USB-to-I2C interface, and software GUI that supports stand-alone operation or an external microcontroller. Silicon Labs recently introduced a fully integrated, precertified Bluetooth Smart module solution that provides a speedy path to low-power wireless connectivity for the IoT. 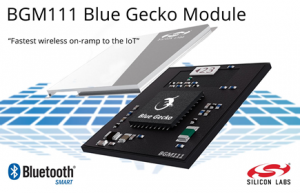 The BGM111 module is the first in a family of advanced Blue Gecko modules delivering integration, flexibility, energy efficiency, and toolchain support with an easy migration path to Blue Gecko system-on-chip (SoC) solutions. It simplifies Bluetooth Smart design for a wide variety of applications ranging from smart phone accessories to industrial sensors. Based on Silicon Labs’s Blue Gecko wireless SoCs, the 12.9 mm × 15 mm × 2.2 mm BGM111 modules provide a plug-and-play Bluetooth Smart design precertified for use in North America, Europe, and the Asia-Pacific. The BGM111 modules are preloaded with the Bluegiga Bluetooth 4.1-compliant software stack and profiles and are field-upgradable using device firmware upgrades to Bluetooth 4.2 and beyond. The BGM111 module is supported by Silicon Labs’s wireless SDK, which means you can use either a host or fully standalone operation through the Bluegiga BGScript scripting language. Using a familiar BASIC-like syntax, BGScript enables you to create Bluetooth applications quickly without using external MCUs to run the application logic. All application code can be executed on the BGM111 module. Pre-production samples of the BGM111 Blue Gecko module, supported by the SLWSTK6101A Blue Gecko wireless starter kit, are currently available. BGM111 module pricing begins at $4.97 in 10,000-unit quantities. The SLWSTK6101A starter kit costs $150. 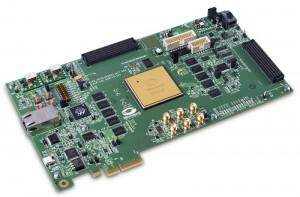 Microsemi recently announced the availability of the RTG4 FPGA Development Kit for high-bandwidth space applications. The innovative kit provides space designers an evaluation and development platform for applications such as data transmission, serial connectivity, and more. The development kit provides all necessary reference to evaluate and adopt RTG4 technology quickly. You don’t need to build a test board and assemble the device onto the board. The RTG4 Development Kit is ideal for evaluating and designing for remote sensing space payloads, radar and imaging, and spectrometry. Other applications include mobile satellite services (MSS) communication satellites, high-altitude aviation, medical electronics, and civilian nuclear power plant control. RTG4 FPGAs feature reprogrammable flash configuration, which makes prototyping easier. Reprogrammable flash technology offers complete immunity to radiation-induced configuration upsets in the harshest radiation environments, without the configuration scrubbing required with SRAM FPGA technology. RTG4 supports space applications requiring up to 150,000 logic elements and up to 300 MHz of system performance. The RTG4 Development Kit features a RT4G150 device offering more than 150,000 logic elements in a ceramic package with 1,657 pins. Kits are available now for purchase. 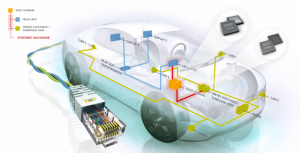 NXP Semiconductors has launched product portfolio for automotive Ethernet that builds on BroadR-ReachT, which is an automotive standard defined by theOPEN Alliance industry group. NXP’s automotive portfolio features two product families: Ethernet transceivers (TJA1100) and Ethernet switches (SJA1105). The Ethernet PHY TJA1100 supports automotive low power modes. The systems sleep when the engine is off. 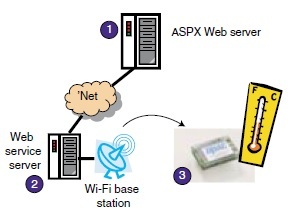 However, the Ethernet PHY stays partially powered and wakes up the system only when there is network activity. NXP’s SJA1105 Automotive Ethernet Switch uses Deterministic Ethernet technology to guarantee message latency in applications such as autonomous driving, where deterministic communication is vital for reasons of operational efficiency or functional safety. Deterministic Ethernet supports the trend toward increasing bandwidth requirements of up to one gigabit, while ensuring high reliability in networked control systems and high availability in fail-operational applications. It comprises several standards, including Ethernet (IEEE 802.3), Time-Triggered Ethernet (SAE AS6802) as well as Audio Video Bridging (AVB), and Time-Sensitive Networking (TSN). TJA1100 Ethernet transceivers are available in prototype samples. They will enter mass production in late 2015. SJA1105 Ethernet Switches are available upon request. 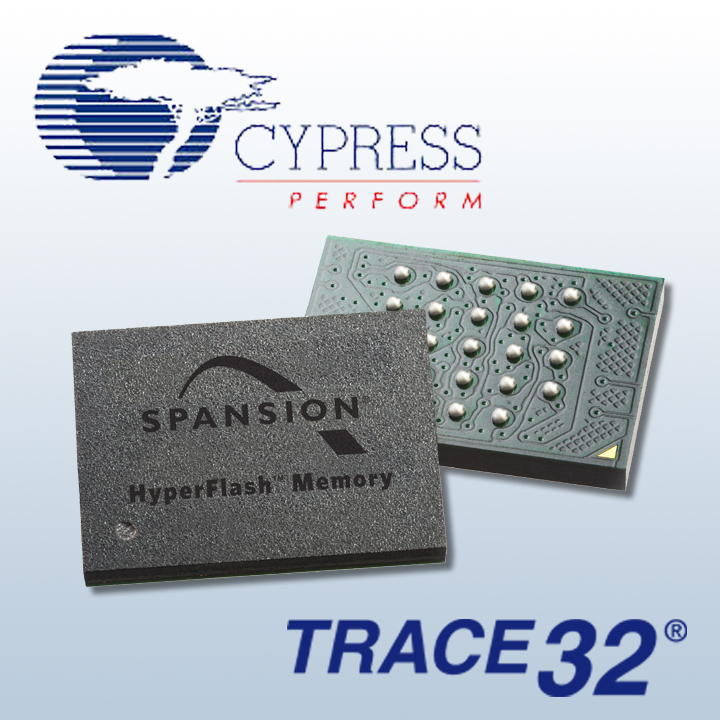 Lauterbach recently announced its support for the Spansion HyperFlash Memory with the TRACE32 tools. HyperBus Interface was introduced by Spansion in 2014 as an improvement on today’s low pin count memory interfaces and has been broadly implemented by the system-on-chip (SoC) manufactures. HyperFlash Memory is based on the HyperBus interface and provides the important characteristics such as low latency, high read throughput, and space efficiency. TRACE32 tools support the HyperFlash memory with the intuitive, fast, and flexible Flash Programming feature that also provides you with control of reading, displaying, and erasing the content of the flash memory. The content is displayed in a standard hex dump, which allows the contents to be checked quickly. The tool supports the pairing of HyperFlash memory with the HyperBus interface and also with the ordinary Quad SPI controller. 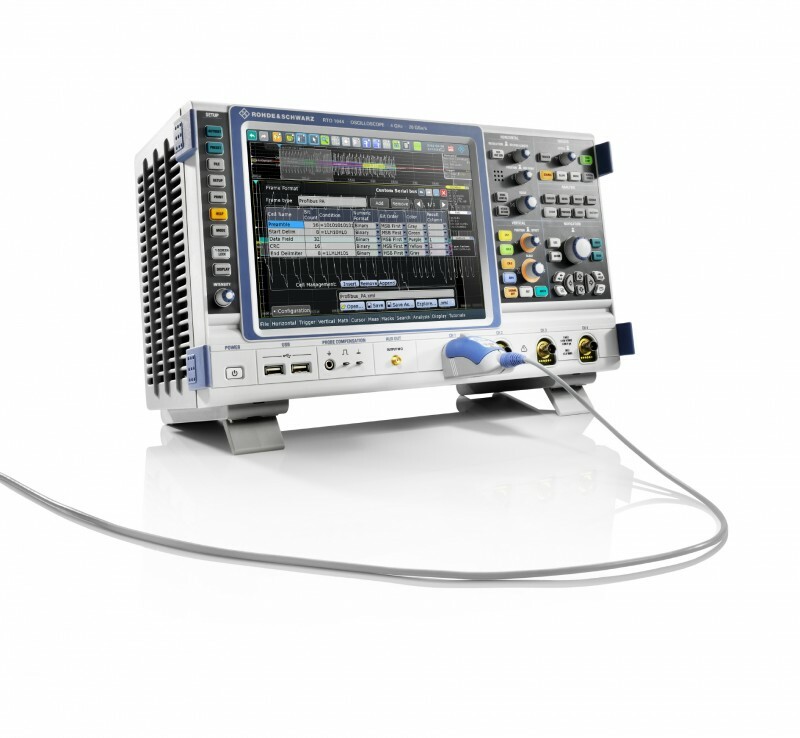 Rohde & Schwarz has expanded its range of trigger and decoder options for the R&S RTO and R&S RTE digital oscilloscopes. 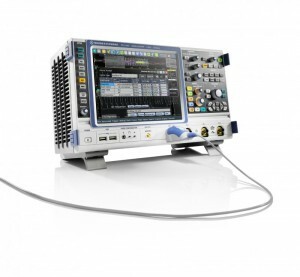 With the R&S RTx-K50, the oscilloscopes help you debug serial protocols that employ Manchester or NRZ coding. The option can be used with a variety of standardized buses (e.g., PROFIBUS, DALI, or MVB) as well as with proprietary serial protocols. Developers of products that use these types of interfaces can easily find implementation errors and so test and release their designs more quickly. The option, which covers data rates of up to 5 Gbps, supports up to 50 different telegram formats, while the format of the serial bus can be configured flexibly. You can define your own preamble, frame ID, data, CRC and other telegram fields. Protocol decoding also takes Manchester code violations into account. High acquisition rates and minimal blind times are provided by the hardware-based trigger implementation on the oscilloscopes. You can trigger on telegram and data content with the R&S RTx-K50 option. The decoded protocol content is displayed in an easy-to-read, color-coded format. 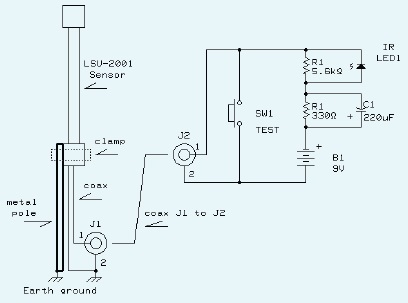 Time correlation with the analog signal makes it easy to identify faults caused by signal integrity problems. A tabular list of the protocol contents is also provided. The standard mask test with up to 600,000 tests per second makes it possible to check the signal quality faster with an eye diagram than with any other solution. In addition, both oscilloscope series from Rohde & Schwarz support the option of decoding up to four different serial protocols in parallel. 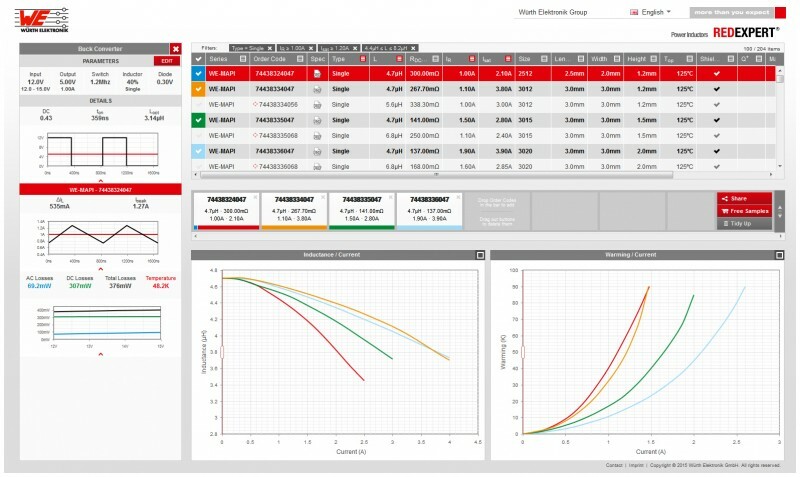 Würth Elektronik recently published RED EXPERT, a new online tool you can use to simulate the power inductors. With just a few clicks, you can select the power inductors and calculate the complete AC losses. RED EXPERT enables extremely precise loss calculation because it is not based on the known Steinmetz models with sinusoidal excitation. 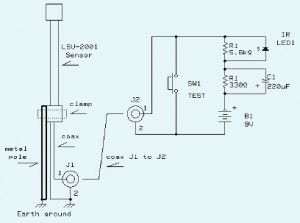 Instead, it is derived and validated from measurements of the power inductors in a switching controller setup. The losses determined with RED EXPERT are based on current and voltage waveforms typical in applications. Besides the core and winding losses, they also include the losses arising from the specific geometries of the inductance, such as the air gap. Particular highlights of the RED EXPERT AC loss model are the range of duty cycles supported from 10% to 90% and the switching frequency range of 50 kHz to 5 MHz. This gives the RED EXPERT AC loss model a previously unattained precision. RED EXPERT is freely available in German, English, Spanish, Japanese, Russian, and Chinese at www.we-online.com/redexpert. 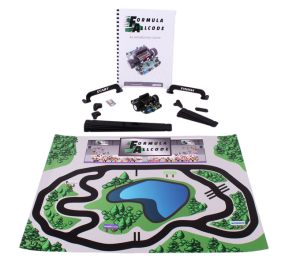 Matrix TSL has launched a Kickstarter campaign for its Formula AllCode robotics course, which features a high-specification, Bluetooth-enabled robot. You can program the robot via Python, AppBuilder, Flowcode, Matlab, LabVIEW, C, and more. It is compatible with Raspberry Pi, Android, iPhone, and Windows devices. The funds raised from this Kickstarter project will allow Matrix to take the current prototype development shown in the project videos to the next level with a technical specification to beat any other like-for-like robot buggy and subsequent manufacture of 1000 units to be launched world-wide. 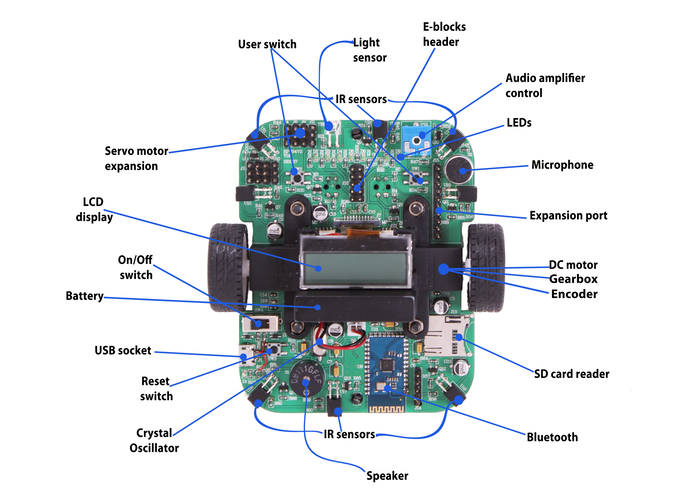 By backing the Kickstarter campaign, you are supporting a project which allows users to develop their robotics understanding on a platform of their choice. Whether your starting out with your first robotics project or you’re a fully fledged robotics developer, the Formula AllCode will work for you. The project must be funded by Sunday, September 6, 2015.